In Norway we have a National Identification Number which is an 11-digit personal identifier, which also is referred to a Birth Number as this is given to every Norwegian borned at birth. 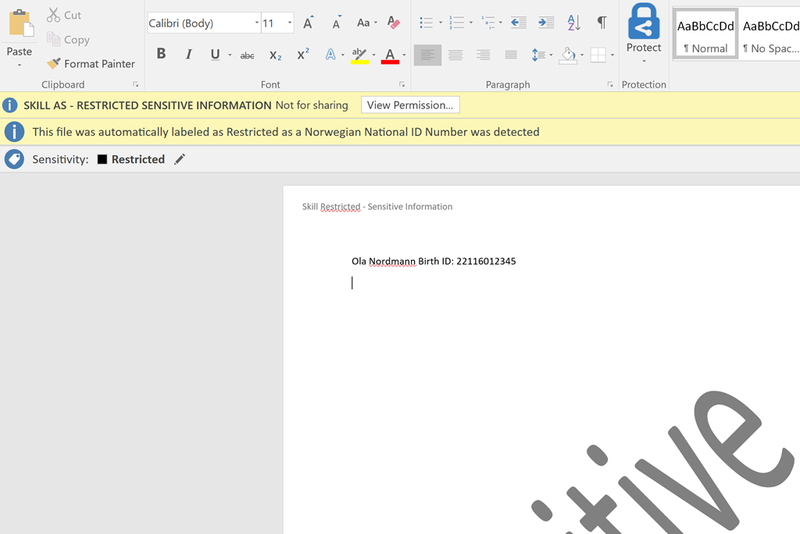 The special thing about Norwegian National ID Numbers are that they are not only used for personal identification, but also in some official scenarios is used for source of authentication. 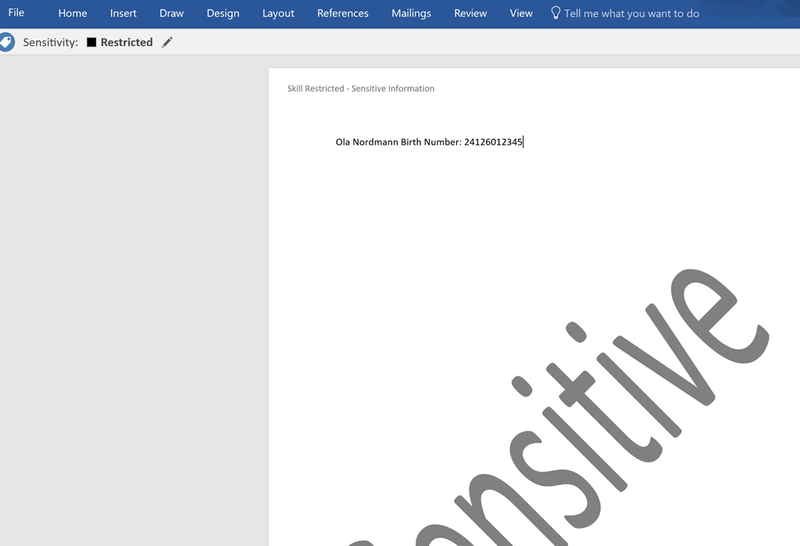 This makes this ID number highly sensitive, and should not be shared around in for example documents and emails. 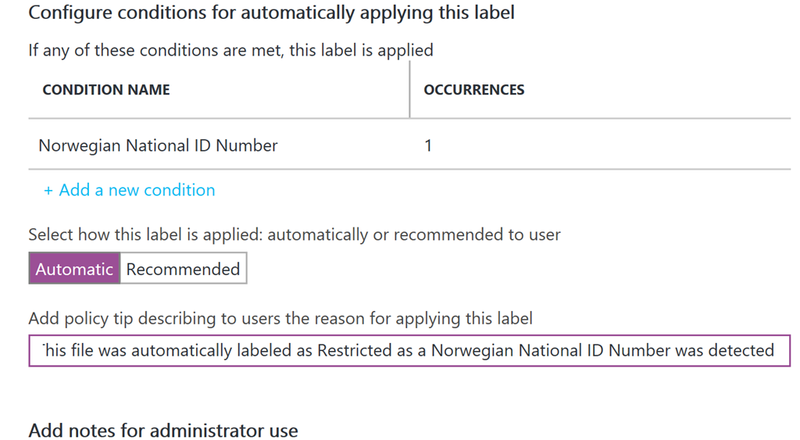 In this blog post I will look at how Azure Information Protection can automatically detect and classifiy documents that contains the Norwegian National ID Number, and more over how we can use Azure Rights Management Services (RMS) to automatically apply a RMS template which encrypts and sets permissions for these classified documents. I will show this step by step, so read on for details. 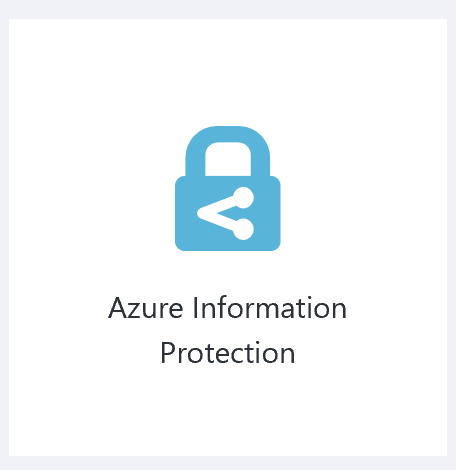 The requirement for setting this up is that you have a Tenant with an Azure AD Directory, and licensed with EMS Suite (E3 or E5), Secure Productive Enterprise (SCE) or Azure Information Protection P1 or P2 licenses. You will need the EMS E5/AIP P2 if you want to be able to automatically classify and label documents, as E3/P1 only enables users for manual classification and labeling. You can get EMS E5 trial licenses if needed. 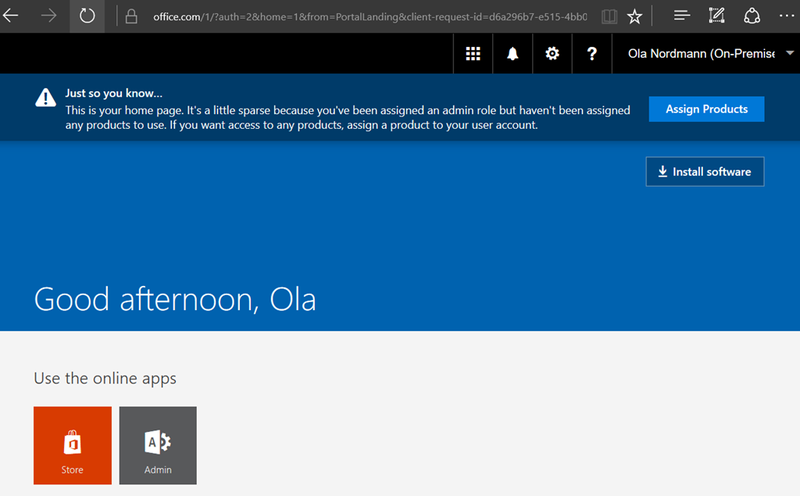 Next, in a new browser window, sign in to the Azure portal as a global admin for your tenant. 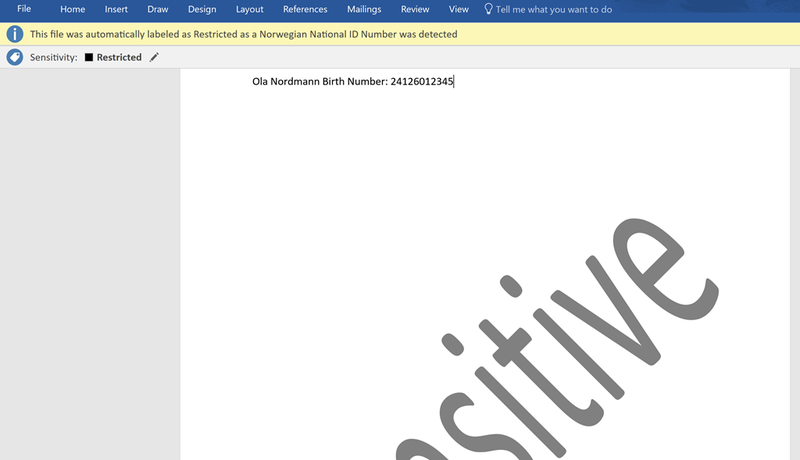 In this step we will configure the classification and labeling for the Norwegian National ID Number. I give the new label the name Restricted, and provide a custom tooltip for the users to see. 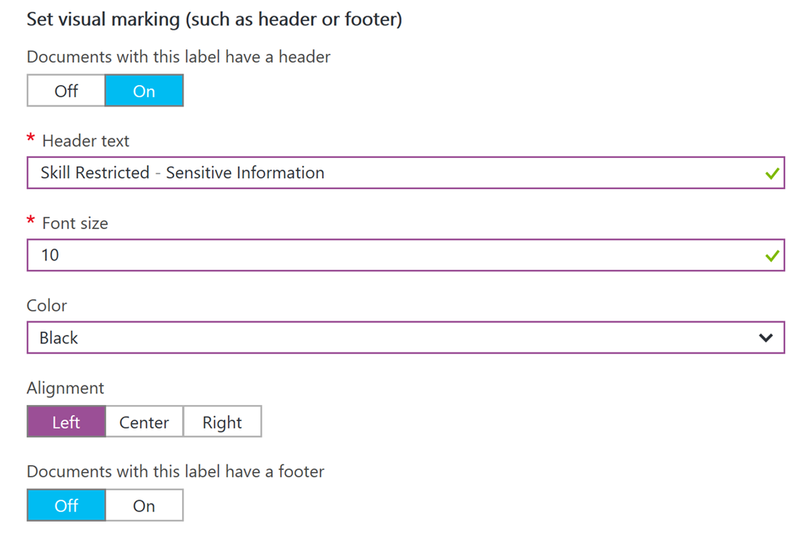 I can select another color if I want, and for now I don’t want to add an Azure RMS template for protection. Then I select Custom type of condition, because the built-in ones does not contain the Norwegian ID number. Under Custom I specify a name for the condition, and select to match based on a regular expression. See explanation below. I can also match on case sensitivity (if letters) and number of occurances if I want. So, the main part here is the Regular Expression (RegEx) that will discover if there could be a possible match on a Birth Number/Norwegian National ID Number. I will not dive into details on Regular Expressions here on my blog, but in short the following expression will match if the first 6 digits are a valid date. For example 31 days in the months Jan, Mar, May, July; Aug, Oct and Dec, and 30 days in the rest. In addition, this will not check for leap years, so will accept 29 days for each Feb to simplify. The last 5 digits are accepted if they are 0-9. But for now this should be sufficient. 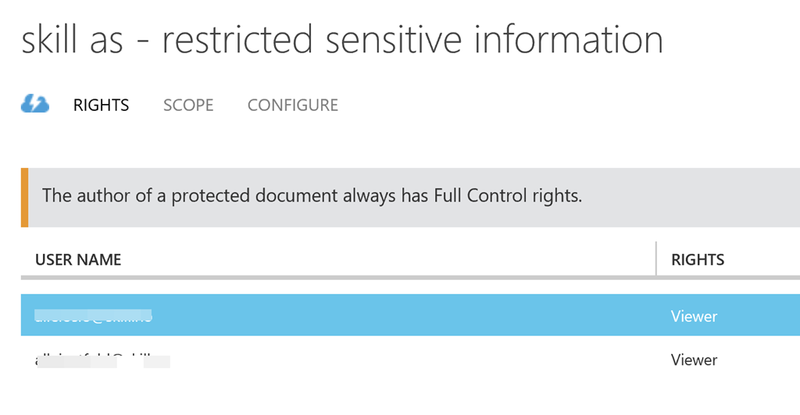 Next step is to Install the Azure Information Protection client on a PC that has Office installed. Download the client from from the Microsoft download center, https://www.microsoft.com/en-us/download/details.aspx?id=53018. Run AzInfoProtection.exe and follow the prompts to install the client. As we have configured the tenant with the default and customized label, it doesnt matter if you install the demo labels as the tenant settings will override. 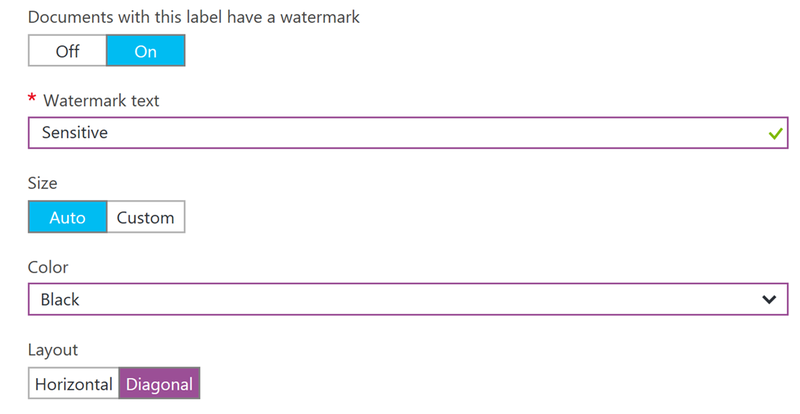 I then have to save the document, because the validation of conditions for classification labels happens at save time. At this point we are able to automatically classify the document as restricted and sensitive, but the document can still be shared unencrypted if the user wants to do that. In the next step we will see how we can configure automatic data protection for this classification label. 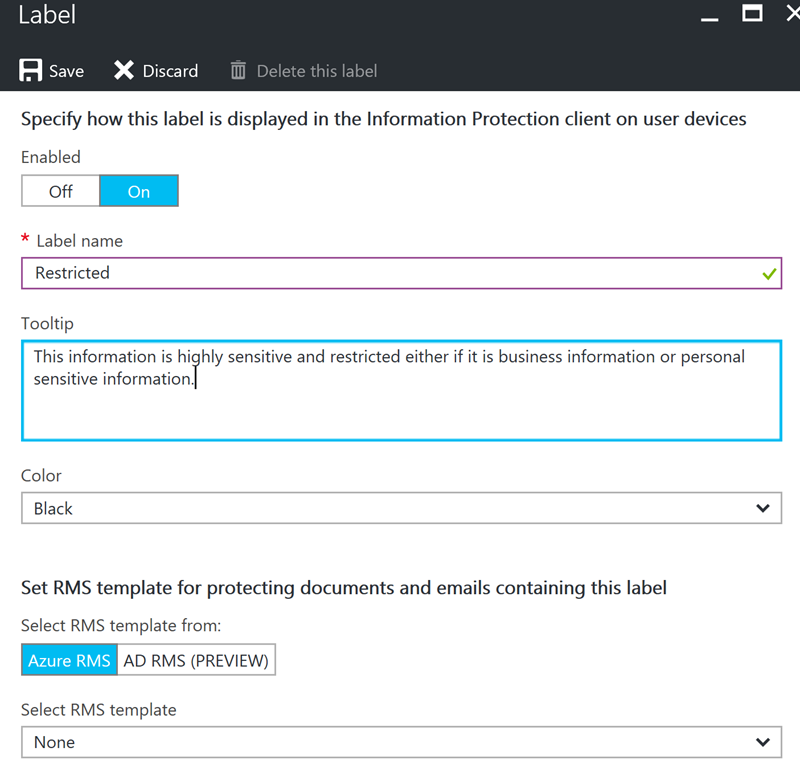 If we want to configure automatic data protection for classified documents I will need to either use an existing or create a new Azure RMS Template. In this case I will create a new template. 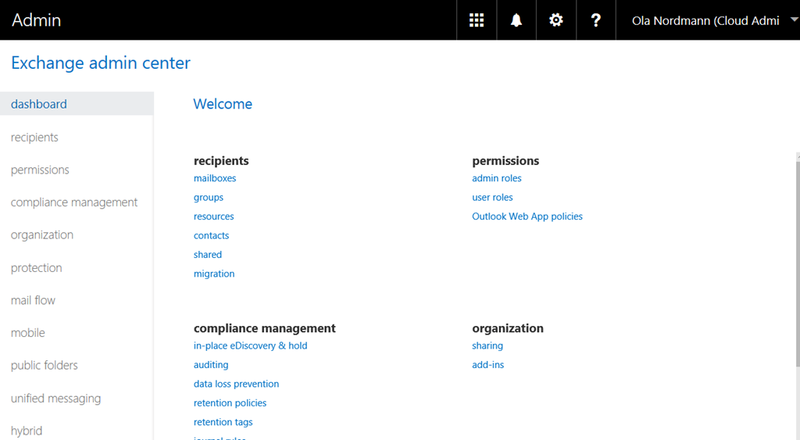 This must, for now, be done in the old Azure Portal at manage.windowsazure.com, and under your Azure Active Directory and Rights Management settings. 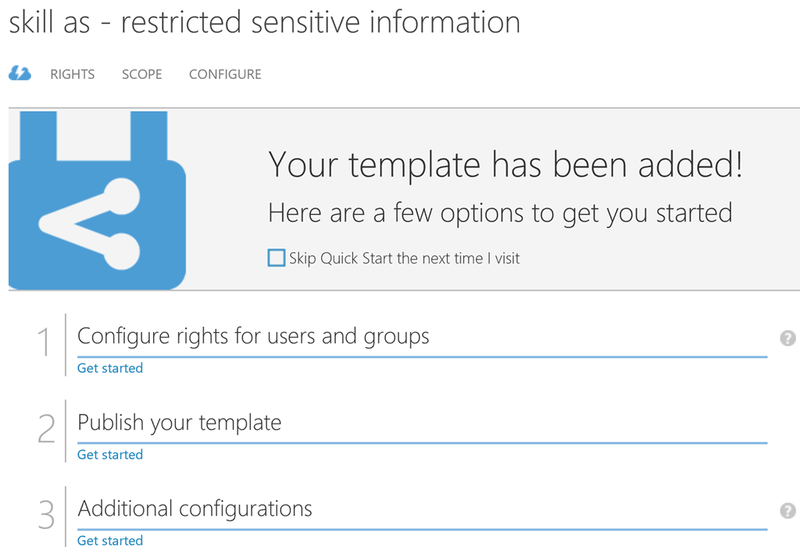 After creating the RMS template I can now configure rights, scope and optional configurations. The Viewer Role has the following custom rights, which suits my scenario where I want to restrict sharing for Restricted Sensitive Information. As I am the owner of the document, I can share it internally to any user in my organization, but they will be prohibited to do any operations besides viewing the document. 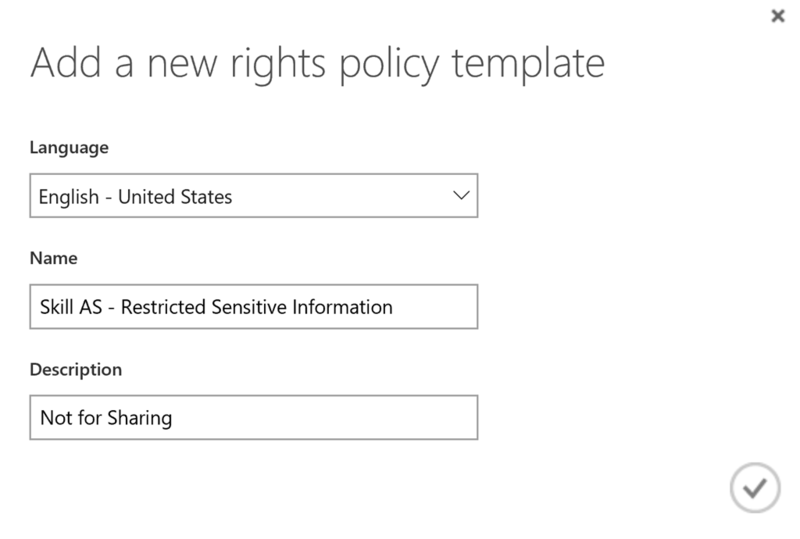 If I wanted to restrict my users from even sharing it internally, I would need to configure an Office 365 Data Loss Prevention (DLP) Policy, which can apply to Exchange Online, SharePoint Online and/or OneDrive for Business, and look for Norwegian National ID Number there. But that would be a topic for another blog post! Does this only apply to Office documents? 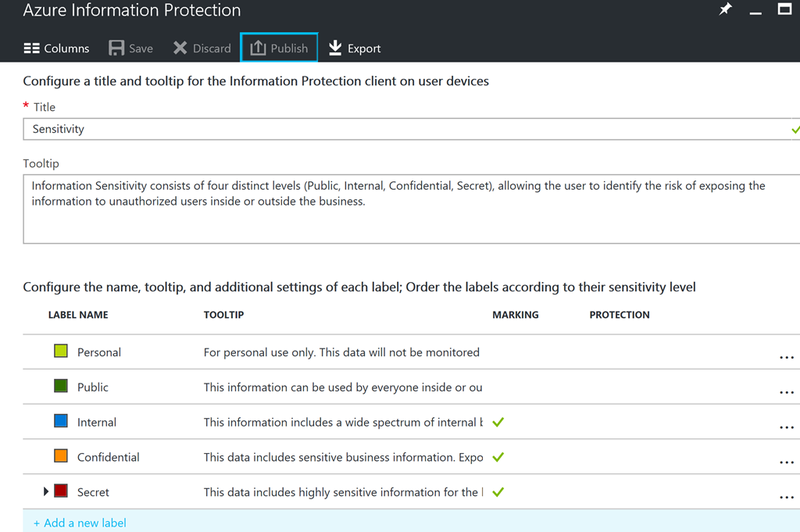 No, when you install the Azure Information Protection client you get the opportunity to classify and protect e-mails sent with the Outlook client as well. 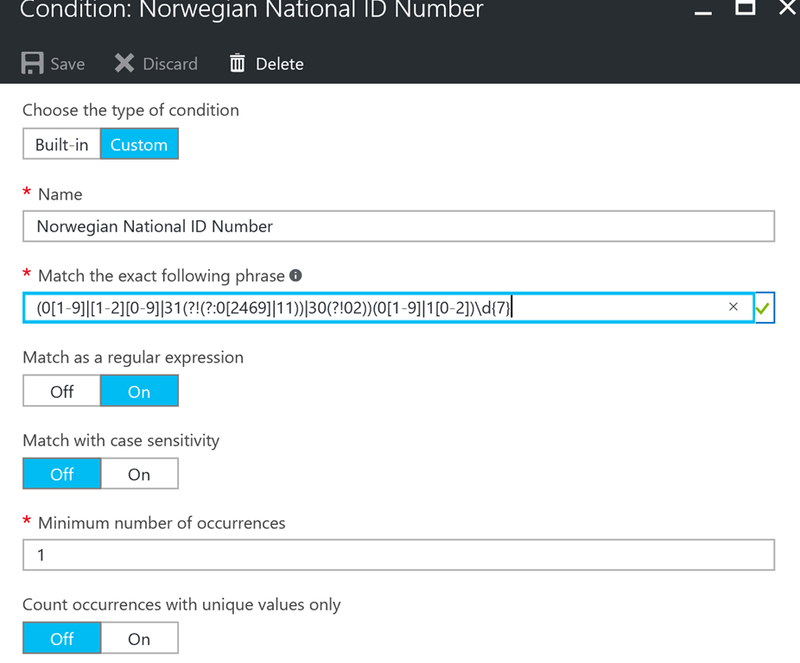 In this blog post I have shown how you can use Azure Information Protection (AIP) to classify Office documents and Outlook e-mails and how you can use conditions to automatic apply that classification based on for example a Norwegian National ID Number detection with the use of a regular expression. 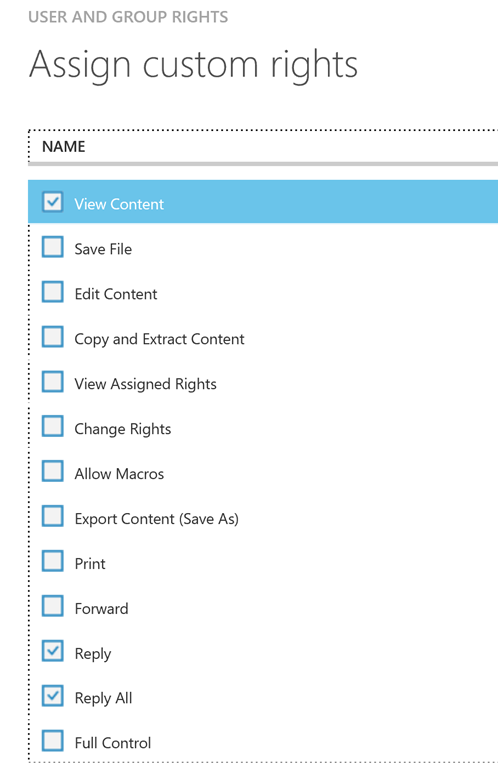 In addition I have shown how you can use Azure RMS and a template to automatically encrypt that document and set the permissions for the users in my organization that only allows viewing. 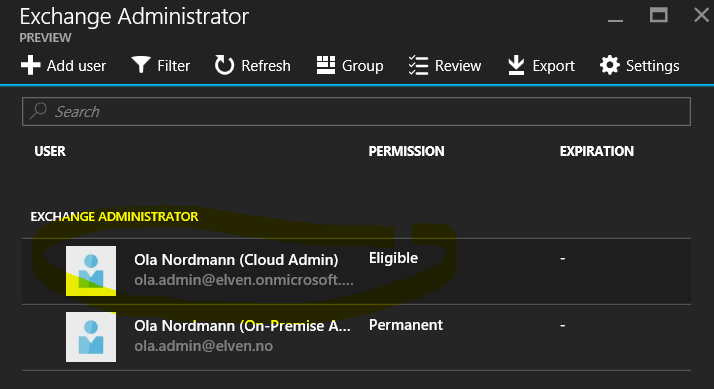 This entry was posted in Azure Information Protection, Azure RMS, Enterprise Mobility + Security, Enterprise Mobility Suite and tagged Azure AD, Azure Information Protection, Azure RMS, Cybersecurity on November 25, 2016 by Jan Vidar Elven. How to enable Azure MFA for Online PowerShell Modules that don’t support MFA? 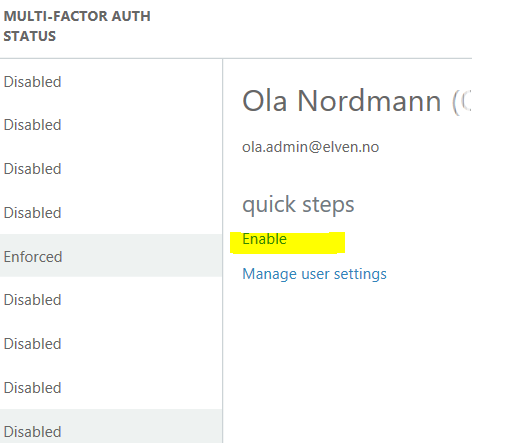 In this blog post I will look into how you can accomplish Azure Multi-Factor Authentication for Admins even though the Online PowerShell Module don’t support it. 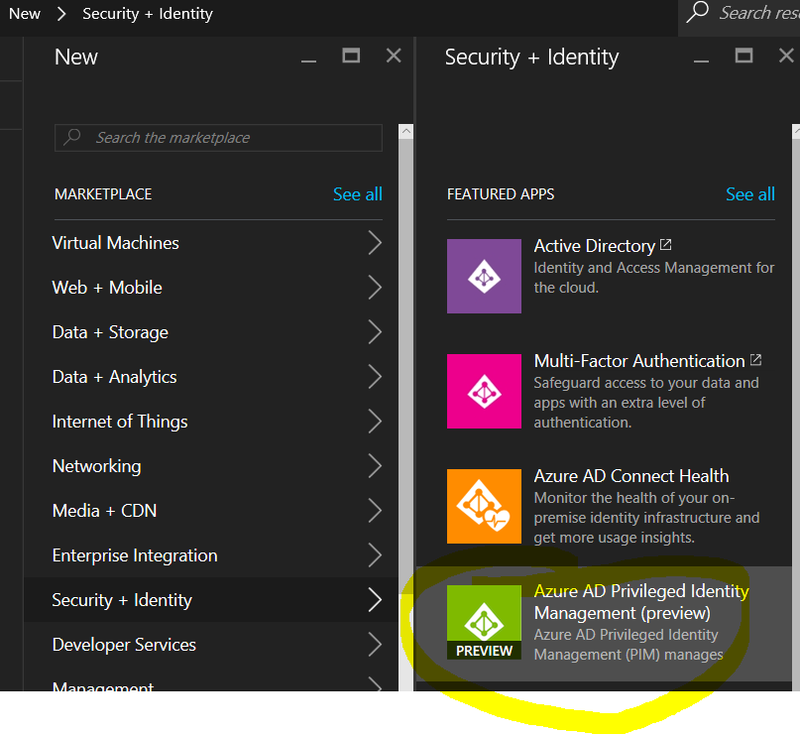 The key to do this is to implement and use Azure AD Privileged Identity Management, which is an Azure AD Premium P2 / EMS E5 feature. Administration of Online Services with PowerShell can be done with different PowerShell modules or for some scenarios setting up a remote session to the Online Service. But not all scenarios support Azure MFA natively. Azure PowerShell. Supports Azure MFA with Add-AzureAccount. Azure Active Directory PowerShell MSOnline Module. Supports Azure MFA with Connect-MSOLService. The Public Preview of Azure AD v2 PowerShell (https://azure.microsoft.com/en-us/updates/azure-ad-new-powershell-cmdlets-preview/). 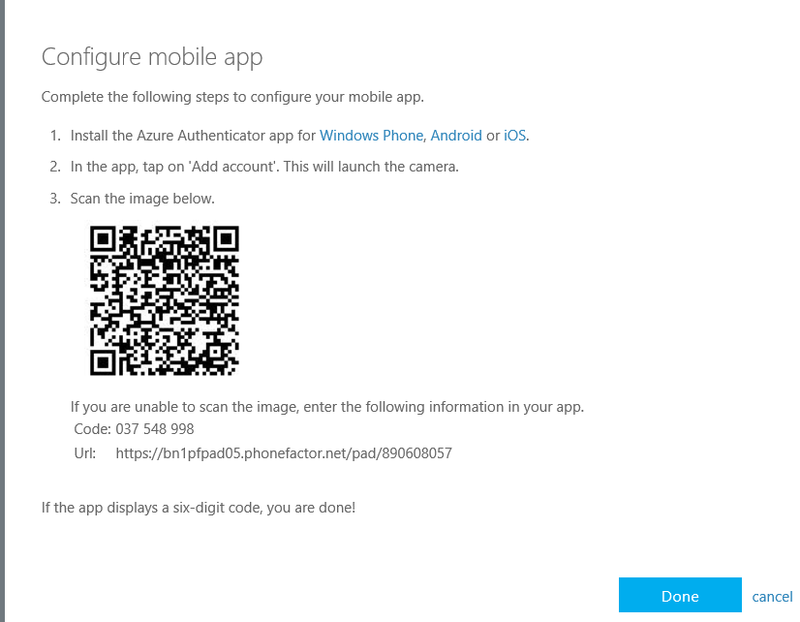 Supports Azure MFA with Connect-AzureAD. 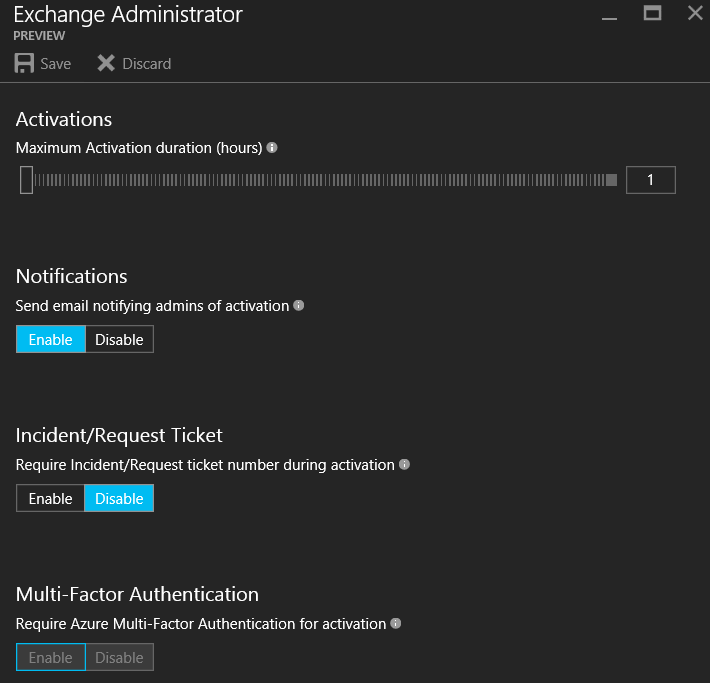 Update Dec. 2016: Exchange Online Remote PowerShell now supports Azure MFA with Connect-EXOPSSession, read more https://gotoguy.blog/2017/01/12/exchange-online-powershell-with-modern-authentication-and-azure-mfa-available/. All of these above supports Azure MFA as long as you are not passing in a Credential object. There are also more advanced scenarios for programmatic access with Access Token and Certificates that I will not cover here for some of these modules. 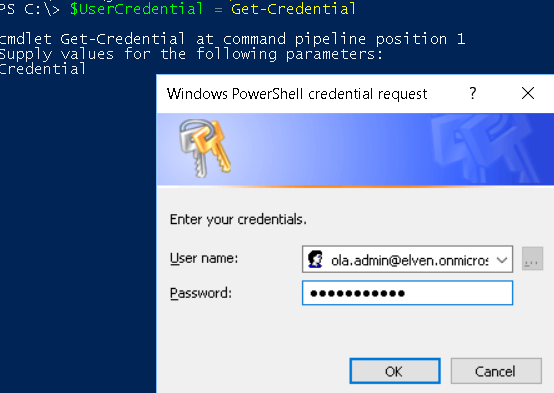 The main thing is that when you create a Credential object with Get-Credential, and pass that in as a Parameter to the above modules, Azure MFA will not work if the Admin user has been configured to use that. We’ll see some examples later in the blog. 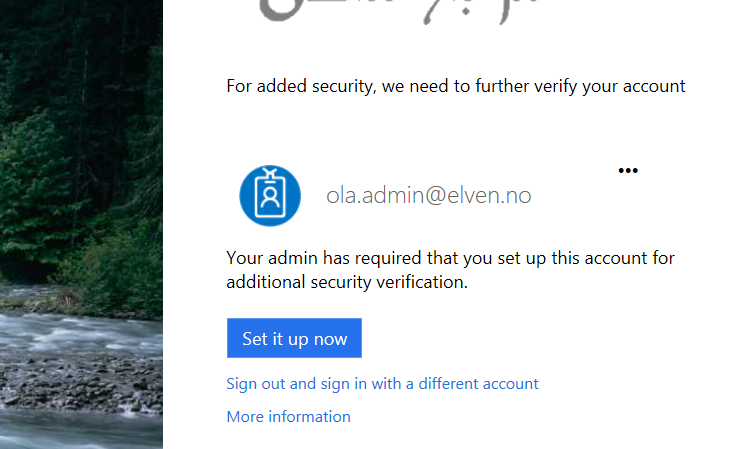 Note also that if you have an older version of MSOnline or Aadrm which required the Online Sign-In assistant, these will not work with Azure MFA and you must upgrade to the latest versions. 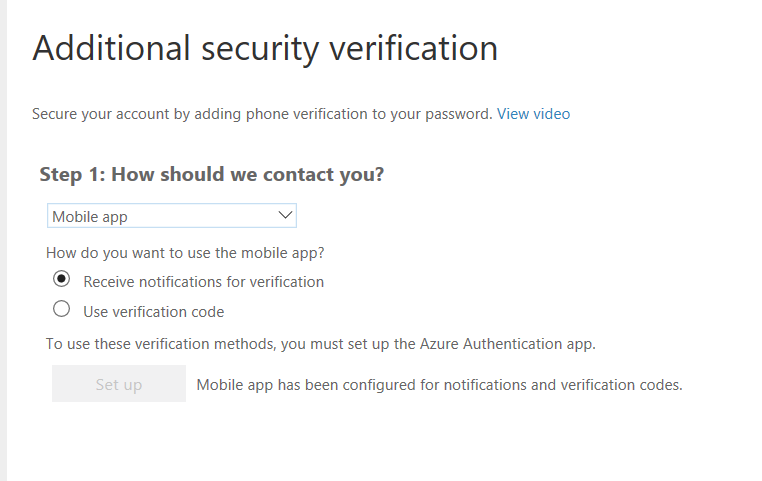 In these scenarios you must create a Credential object, and pass that in as a parameter when connecting to the service, thus blocking the use of Azure MFA. Today I just don’t find it acceptable for Admin accounts for any Online Service like Azure or Office 365, to not use Multi-Factor Authentication or some other protection mechanism, and just depend on username and password! In addition to that, as an Organization you have to have control of your identities, employees and admins come and go, I have seen many times that Organizations still have Admin accounts for users that have left the company for a long time ago. Most Organizations have Directory Synchronization from local Active Directory to Azure AD, making it possible to synchronize your local admin accounts. You then have a choice: Should I use synchronized admin accounts for the Admin Roles in Azure/Office 365? Or should I only create Cloud only admin accounts for this purpose? Synchronized On-Premise Admin Accounts for the most important, permanent and sensitive admin accounts, like Global Admins, Security Admins, Azure Subscription Admins and more. These accounts will be set up to require Azure MFA, as these accounts possibly can connect to On-Premise resources. 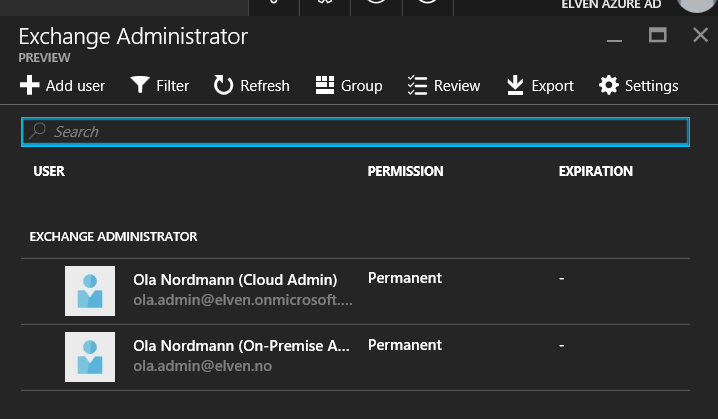 Cloud Only Admins accounts for Role Based Administration, additional temporary Global Admins or other scenarios for intermittent Azure and Office 365 administration. 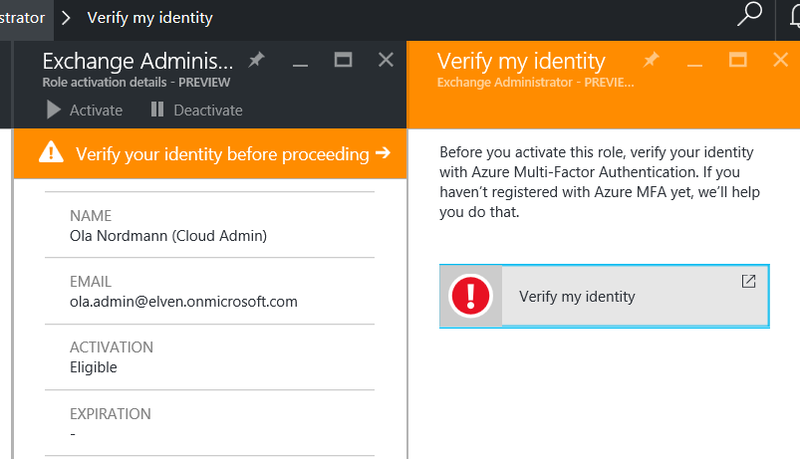 These accounts will not be set up for Azure MFA, but I use Azure AD Privileged Identity Management to require Azure MFA when activating the role. Some of these accounts also includes service accounts for Directory Synchronization, Intune Connector etc. 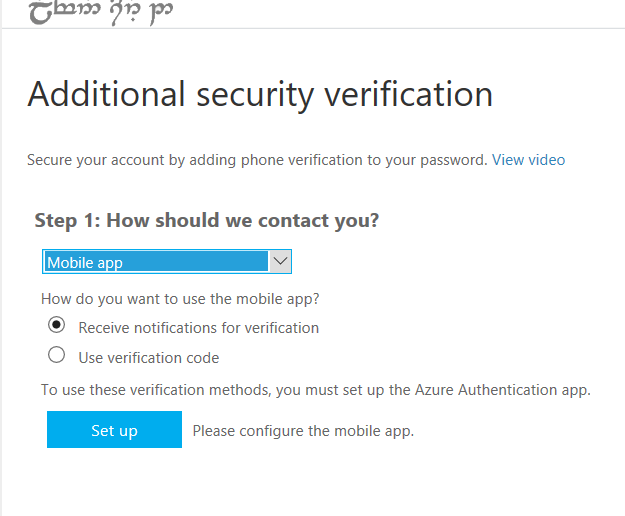 In general all of the permanent Admin Accounts with a few exceptions are required to use Azure MFA. These Admin accounts can use all PowerShell modules that support MFA when connecting. 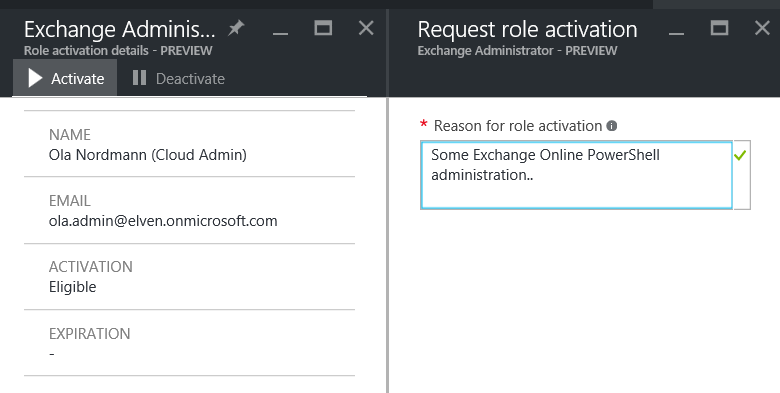 Role-based admins (for example Exchange Admins, Skype for Business Admins,..) are set up to be Temporary/Eligible Admins in Azure AD Privileged Identity Management, which require Azure MFA at activation time. After the admin role is activated, he or she can use the PowerShell modules/remote sessions that don’t support Azure MFA natively. 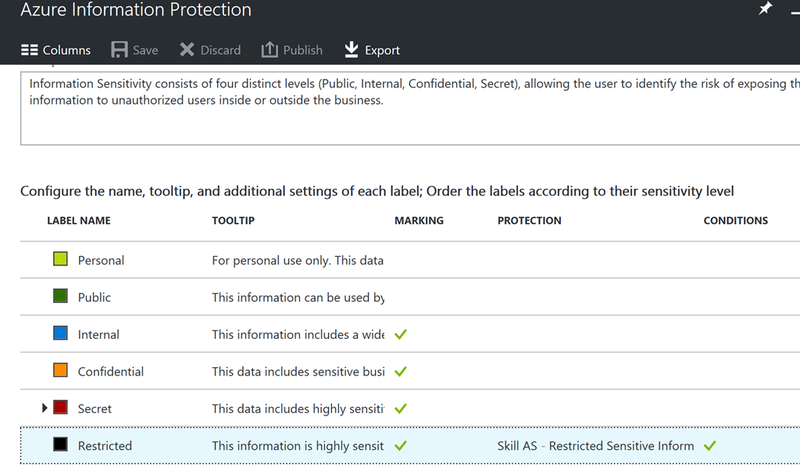 The downside of this solution is that Azure AD Privileged Identity Management require an Azure AD Premium P2 license or Enterprise Mobility E5 license, which will be Generally Available Sept 15th. 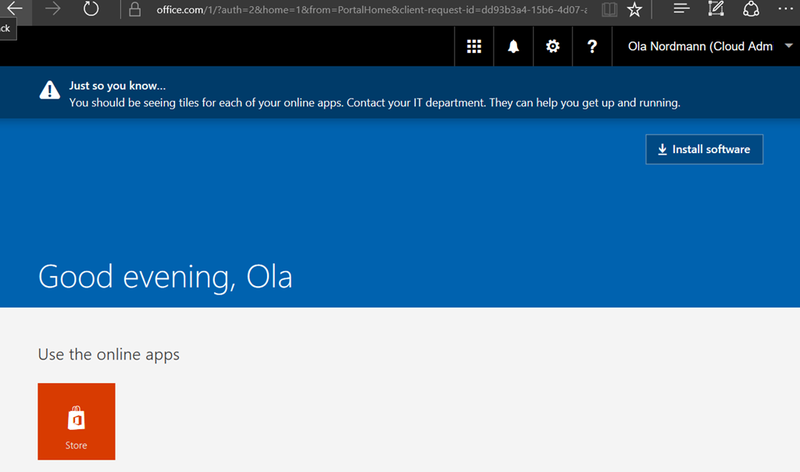 Azure MFA are free to use for Admin accounts for Online Services. In the following steps I will show how to set this up and how it will work. For the purpose for this demo I will work with my demo environment with the tenant name elven.onmicrosoft.com. I have also configured directory synchronization from my on-premise Active Directory, these users will have a UPN suffix of elven.no. In my environment I have a fictional character called Ola Nordmann. 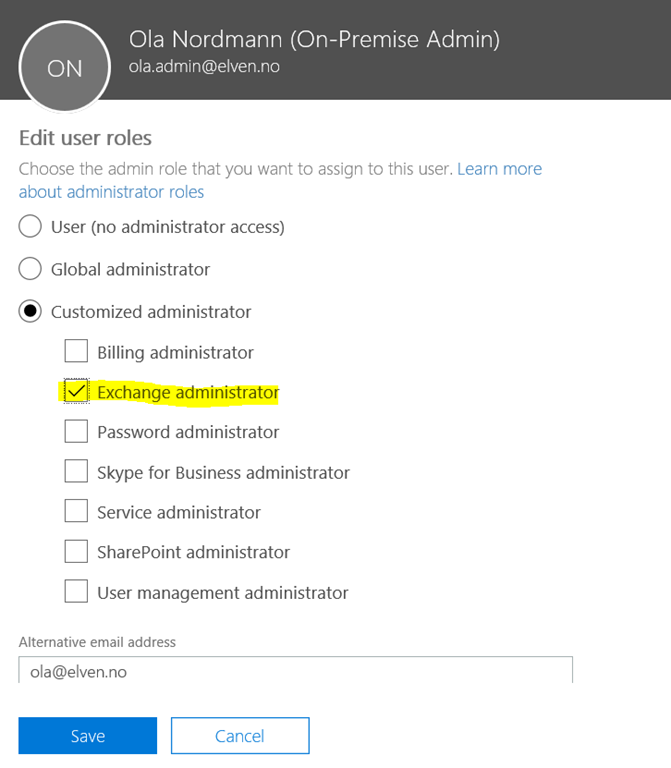 Ola is an Exchange Admin in our Hybrid Exchange environment, and needs permissions to administer Exchange Online in Office 365 both via the management portal and via Exchange Online PowerShell. As per the solution described, I will configure and require Azure MFA for the on-premise admin account, and for the cloud admin account I will use Privileged Identity Management and MFA for role activation. 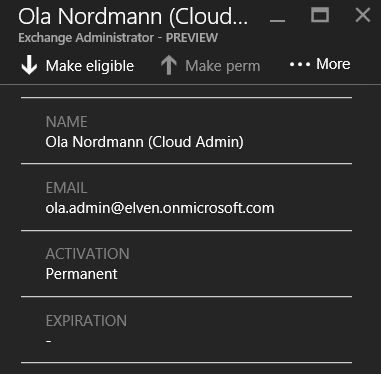 Next, I will give Ola Nordmann the Exchange Administrator role, so that he can administer Exchange Online. 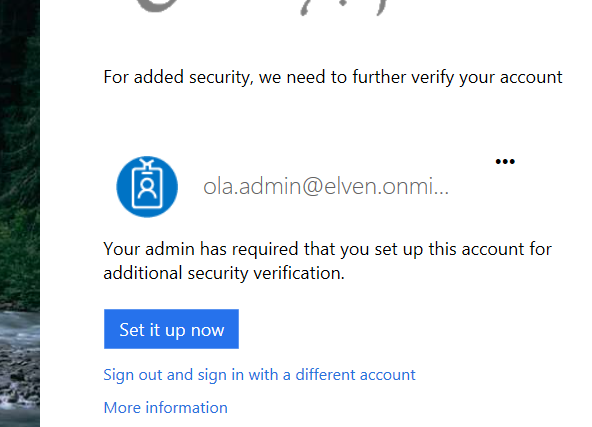 So, at this time, both admin users are Exchange administrators, but only the ola.admin@elven.no on-premise admin account has been configured for multi-factor authentication. Now I will log on the ola.admin@elven.no account to https://portal.office.com. 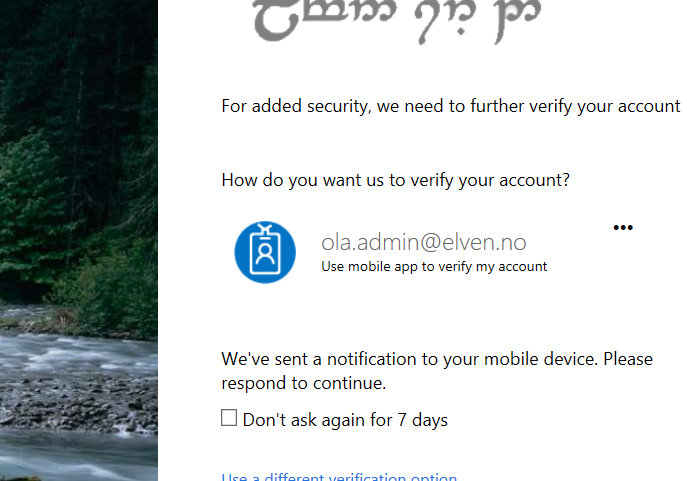 I open up the Microsoft Authenticator app on my phone, and follow the instructions from above. After that I get confirmation that the mobile app has been configured. At my phone I get the notification in the App and select verify, and I should be successful. Since I only have set up the mobile app, I also need to add phone number verification in case I lose access to the app. I type my mobile phone number and press next. 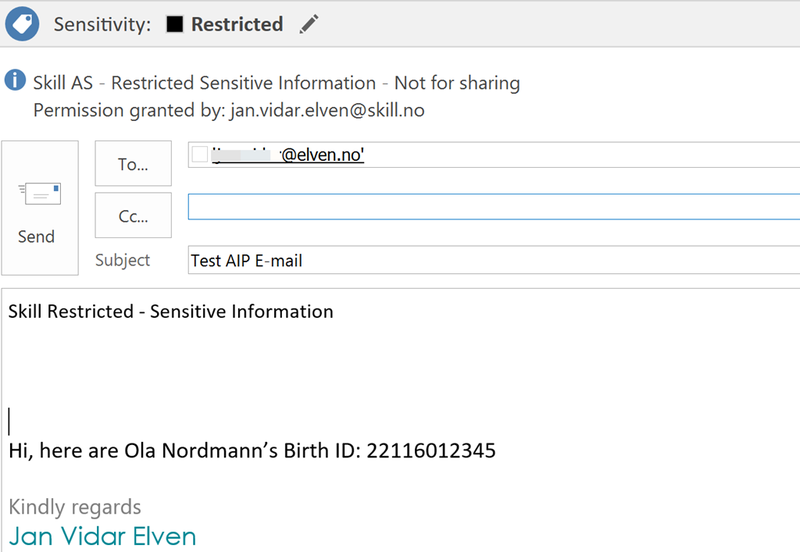 As expected this will fail, as multi-factor auhtentication is required for the ola.admin@elven.no account. In the next part we will look at the other cloud admin user and configure the workaround using Azure AD Privileged Identity Management. The first Global Administrator that set up Privileged Identity Management will added to the Security Administrator and Privileged Role Administrator Roles. After that we can manage the privileged roles. If you have previously added the solution, you will have to activate your Privileged Role administrator first. 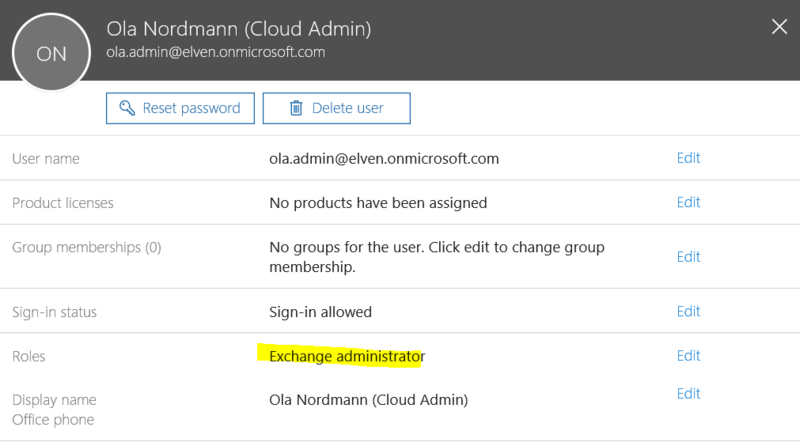 At this point my cloud admin ola.admin@elven.onmicrosoft.com has been removed as a permanent Exchange Administrator, and will require activation before he will be temporarily activated as an Exchange Administrator for one hour duration. 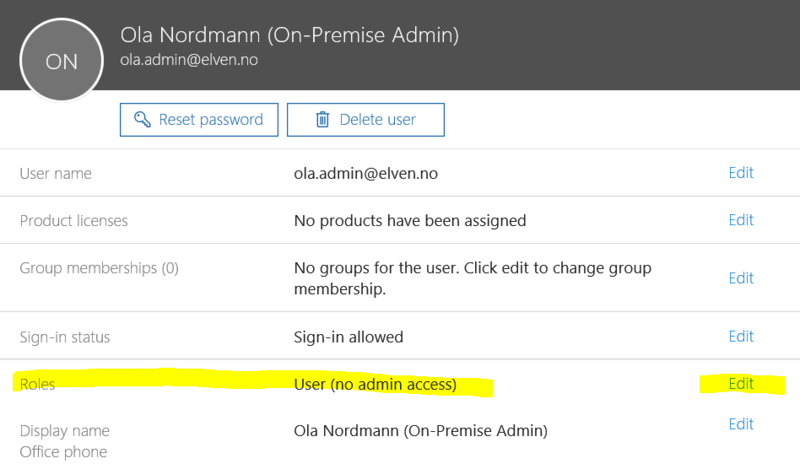 When I log in to the Office 365 portal with the ola.admin@elven.onmicrosoft.com, I will see that this user is just a normal user with no admin links, This is expected as the user hasn’t activated the Exchange Administrator role. At the end of this long blog post, we can summarize that we have accomplished the solution of adding Azure Multi-Factor Authentication for scenarios where the PowerShell Module or Remoting Session does not natively support it. 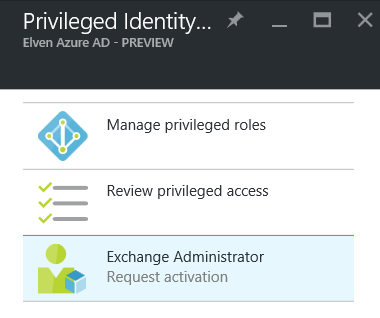 This is made possible by using Azure AD Privileged Identity Management, and by making some role administrators eligible and require MFA when activating. This way they have verified their identity before they connect with the Credential object. 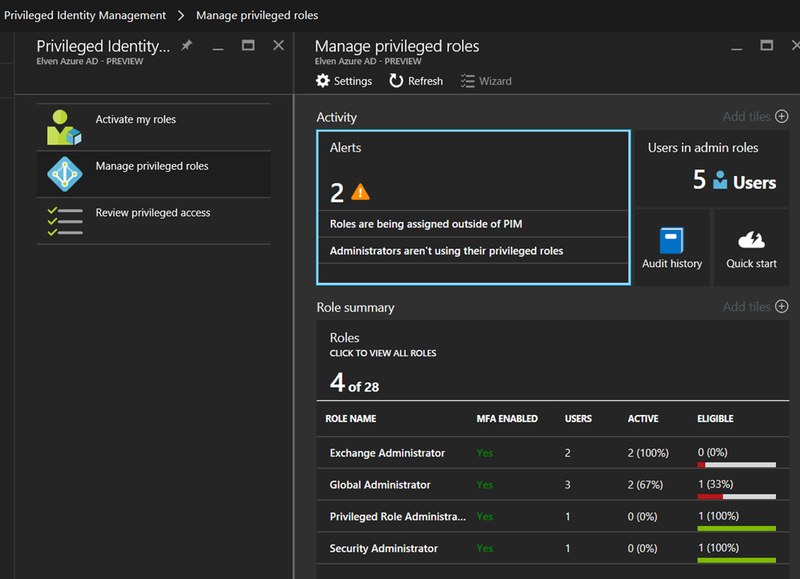 This is just one scenario where both Azure AD MFA and Privileged Identity Management can be used together for increased security and reduce the attack surface of having vulnerable permanent administrator accounts and roles. I hope this blog post have been informative and helpful, please reach out or comment if you want to know more or have any questions. 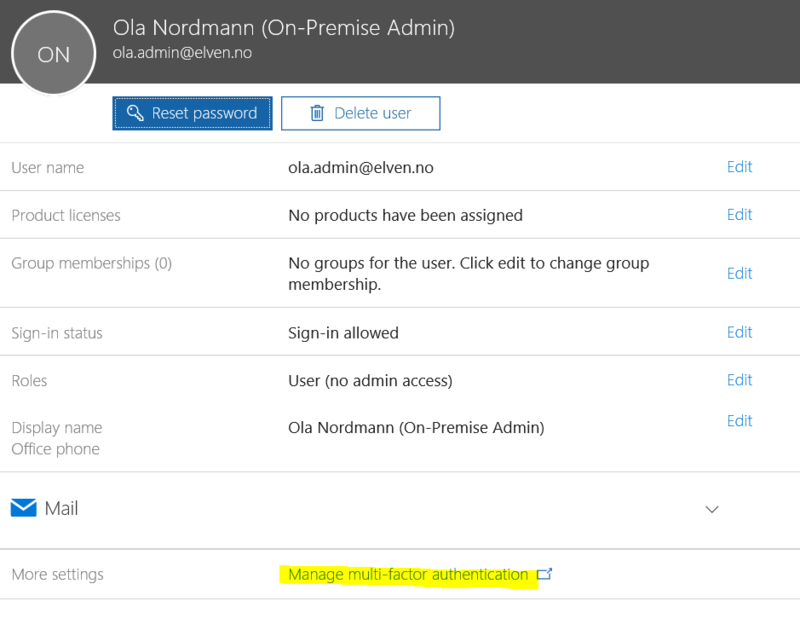 This entry was posted in Azure AD, Azure AD Premium, Azure Information Protection, Azure MFA, Enterprise Mobility Suite and tagged Azure AD Premium, Azure Multi-Factor Authentication, Enterprise Mobility, PowerShell on September 9, 2016 by Jan Vidar Elven.